Thursday, April 11, 2019 - Friday, April 12, 2019 at NYC Health + Hospitals / Bellevue. Registration is now open and runs through 2/15/2019 5:00 PM Eastern Time (US & Canada). This Simulation Training (Training) is intended for direct care providers (MDs, RNs, Paramedics, EMTs, etc.) 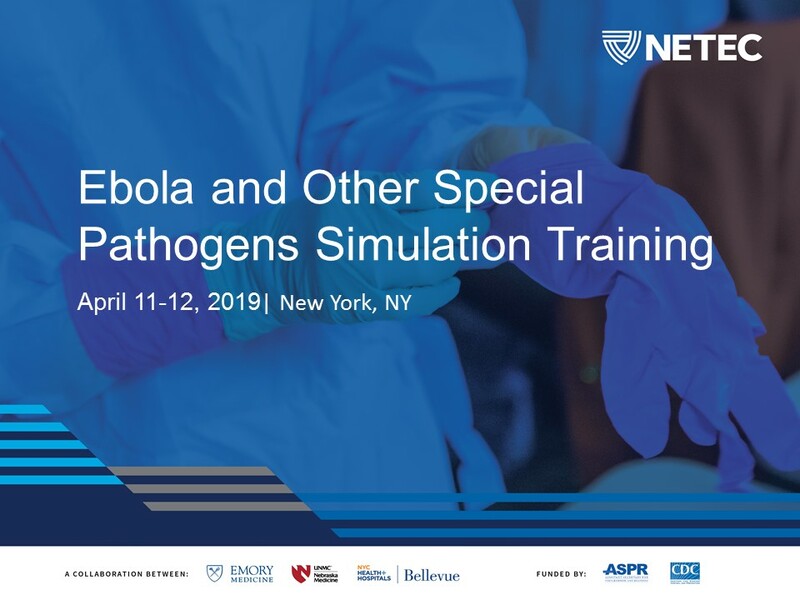 as it will provide information and hands-on practice on several essential skills of caring for patients with Ebola and other special pathogens with a focus on providing safe and effective care in PPE. Due to the simulation nature of this training, there will be a max capacity of 40 participants. NETEC asks that facilities register 1 to 4 participants for this event. If special arrangements need to be made, please contact NETEC at info@netec.org for more information. NOTE: Please do not make travel arrangements until your registration has been approved. Registrations will be processed beginning February 1st. Approved attendees will receive a confirmation email. A course agenda is available here. Three changes of full institutional ensemble, to include suit or gown, shoe covers, apron (if used), PAPR or equivalent, to include belt and battery, gloves. Please contact info@netec.org if you have any questions. Transportation and lodging information will be provided upon registration approval. Registrants must wait for confirmation of their attendance before booking accommodations. The University of Nebraska Medical Center, Center for Continuing Education is accredited by the Accreditation Council for Continuing Medical Education to provide continuing medical education for physicians. The University of Nebraska Medical Center, Center for Continuing Education designates this live activity for a maximum of 11.25 AMA PRA Category 1 Credit(s)™. Physicians should claim only the credit commensurate with the extent of their participation in the activity. This activity has been planned and implemented in accordance with the accreditation requirements and policies of the Accreditation Council for Continuing Medical Education through the joint providership of the University of Nebraska Medical Center, Center for Continuing Education and the National Ebola Training and Education Center. Emory Nursing Professional Development Center (ENPDC) is accredited as a provider of continuing nursing education by the American Nurses Credentialing Center's Commission on Accreditation. Attendees to this CNE activity will be awarded contact hours through ENPDC. The University of Nebraska Medical Center is a joint provider for this program. No conflict of interest has been found with the speaker for this CNE activity nor with the members of the planning committee. The University of Nebraska Medical Center, Center for Continuing Education, EMS and Trauma Division approves this educational opportunity for 11.25 hour(s) of Emergency Medical Services Continuing Education.